Click this link to join other blog hoppers! This is the first Wednesday in July, 2013. 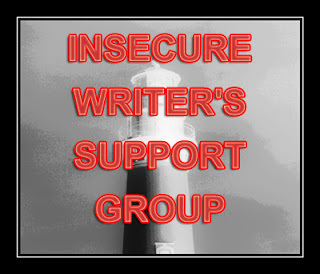 Time once again for the Insecure Writer's Support Group blog hop! My post today is: I'm insecure about feeling insecure about my writing. Make no sense? Hear me out. Writing is a BIG competitive business. Before becoming published, I hadn't considered exactly what sort of large pond it is and how many big fish swim in it. Sure, I knew there were books everywhere (after all, I grew up with a love of reading), but it didn't dawn on me how daunting becoming "an author" could be. At that time, I wrote simply because I had stories in my head that I wanted to share. There was a thrill of reading my words, my plots, on that sheet of paper. (I'm talking back when I wrote in long hand with ink pen and then graduated to a typewriter. No computer, folks) My dream was "to become published". I still remember the excitement upon receiving the offer of my first contract. Fast forward several years. I've gone through three traditional publishers, and am now an independent author. And it's like - reality hits. Hello. There are NUMEROUS other authors/writers out there and we're all in the same boat paddling in this ever-widening pond. And competition? Oh, man. We're all struggling to conceive new and better bait to hook those readers to buy OUR books. However, let me state right here, that 99.999% of the authors I've met, personally and online, are terrific people. We don't steal from each other. If we learn of exciting and terrific ways to market, we gladly share. We enjoy triumphs together. But it's this constant marketing/promoting/salesman-like approach to draw attention to our craft that grows wearying. If we let up for one minute about getting our name "out there" to the reading public - well, our name then is no longer out there to the reading public. I've not been good at selling myself. I hate the old "shove your foot in the door" tactic, and I cringe at the idea of having to announce my "greatness" by declaring, "I won the Soap Box Author of the Year Award." Ugh. I'd rather hide in the corner and read a good book. So, I just wonder - When you feel insecure about the insecurity of this author business, what do you do? I'm far from being published. I am still working on the nerve to query and put my work out there. But if I am ever blessed to publish a story, I already know that this is how I'd feel! So I'm not just insecure about "is my writing good enough to even submit?" I've already jumped ahead to "what if my work is published?" But I think when you're sharing with the world something so personal and so important to you such a novel you've put your whole self into, insecurity is just a part of the process. I saw a tweet the other day from Sarah Dessen where she actually said she still never feels that she can finish a book. What?? I mean how many books has she published? How many fans does she have?? And she's insecure? No two ways about it, there is an ocean out there and there be sharks as well. Yes, we do need to promote but that doesn't mean a hard sell. Hard sell? That's the foot in the door. That's pounding everyone with the current book we have out there with every word we speak or write. I've said many times, we are more than a book. The secret is to draw readers to you, write a good story, and sharing yourself, giving them something to find common ground and to like. Paying attention to your readers/fans. I don't see anything wrong with sharing with our readers awards we've won--it also validates their choice of your books. People like to congratulate others. Who knows, your excitement and gracious response may draw others to read that story. Just my opinion. No offense meant, but I hate word verification, as do many. Half the time I can't read them. You might want to go into your dashboard and remove it. There are many who see verification and bypass commenting. If you don't allow anonymous comments that takes care of a lot of spam machines. I know how you feel! I hate promoting myself. Someone recently pointed out that my blog is 70% about others and so little about me. It feels weird to talk about myself though. Easier to let others do it. What do I do? I keep writing, because, at the end of the day, I'm doing it for me. And I know what you mean. I'm approaching 1700 followers on Twitter. Most of them are writers, and the majority of those are published. When I started writing, I had no clue how many writers and books there were out there. Twitter put things into perspective for me. I find the promotional side of writing very scary, too, and have stages where I kind of step back, and then as you said, you then have to work twice as hard to get back 'up there' again. I think the key is to remember that younger you who loved to write because that's how you share. This past week I stumbled upon a couple books on drawing that gave me a refreshing perspective. The books were teaching one how to doodle and to rediscover the childhood delight of drawing all over again. Another example comes from my writing life. When my husband suggested that I set aside one evening to do whatever I wanted, immediately I itched to create a picture book. I've never considered writing a picture book, because that market seems dominated by illustrators. And yet if I were to write anything for fun, that's apparently what I'd like to do. Of course, I realize that being a successful author will involve writing for markets and promoting any published work. There is a business side I can't ignore or neglect. Yet seems to me that we all got into this field out of a love of words and stories. So, maybe sometimes we just need to take a break and do stuff for fun or even let ourselves hide in a corner with a book.